Practice of Breath, Visualization, connecting with the All that you are and working with your guides, your Divine Sacred Mind ~ the Higher Self, and expanding into a greater perspective of all that you are. Breath being the basis and key to our Oneness with God, our multi-dimensional self and living this within our moment-for-moment life and the intentions, will, and presence we breathe within all that we are. This is how we manifest peace, harmony, abundance and joy as higher dimensional beings. Breath, God light encodings within breath, and how to ignite your visualizations within breath and your the Divinely expansive manifested human creator that you are. Deepen your understanding of Oneness and how to truly ignite, activate the God particles within that are quantumly sewn within all things as are you. Breath and alignment being so very key to the threading within the All That Is. In this Sacred Soul Tribe gathering, we remember all that we are and how breath threads us within greater vastness of energetic fields of play, Universal family and belonging and how we can through our Oneness, through our Unity, begin to ignite the gifts, skills, and wisdoms meant to be brought forth in this now moment to create earthly ~ Heavenly transformation in human form. These are channelled higher vibrational alignments from the Heavenly Councils and consciousness of higher dimensional thought forms, soul threading’s. Aligning the wisdom of Oneness, and centre within how this sensation, feeling, essence is your stillness, peace, silence within your heart centre. ​Gain a grander understanding of this Divine transformative earthly experience and our role to expand and exalt ourselves within it. How to align, how to connect and entangle within a deeper essence of self, of your God~self, and to awaken to spirit held within all things. Opening to initiate yourself within Creation, and walk with knowing, excitement, and remembrance to flow within your synchronistic cues gifted by your celestial teams and Divine Sacred Mind ~ the Higher Self. Remembering your Divine Source essence; your quantum Oneness, All the beings that you are a part of, threaded with, co-creating with. Breathing and flowing with change and aligning to the higher potentials, higher vibrations of co-creation. Some of the most powerful tools I have used on my own personal path and that which I offer to others, is the use of our own unique innate Christed tool-kit to create and infuse your own God~Voice with high vibrational affirmations. There are specific encodations of light and love within words and when used with your own voice, speaking to the multi-dimensional bodies that you are, coupled with your own Divine Sacred Heart in purity of intent to harmonize with God in All moments, you are masterfully igniting your core vibration and personal perspective to shift and therefore shift your reality experience. In aligning to ever-expansive and unconditionally loving bandwidths, we must heal the soul fragments that come forth to challenge us in our ability to create moment-for-moment self~love through masterful refined choice. It is our perspective about the All that we are, all that we exist within, and all that exists within us, that allows us to truly begin to create with limitless potentials and self-knowing. 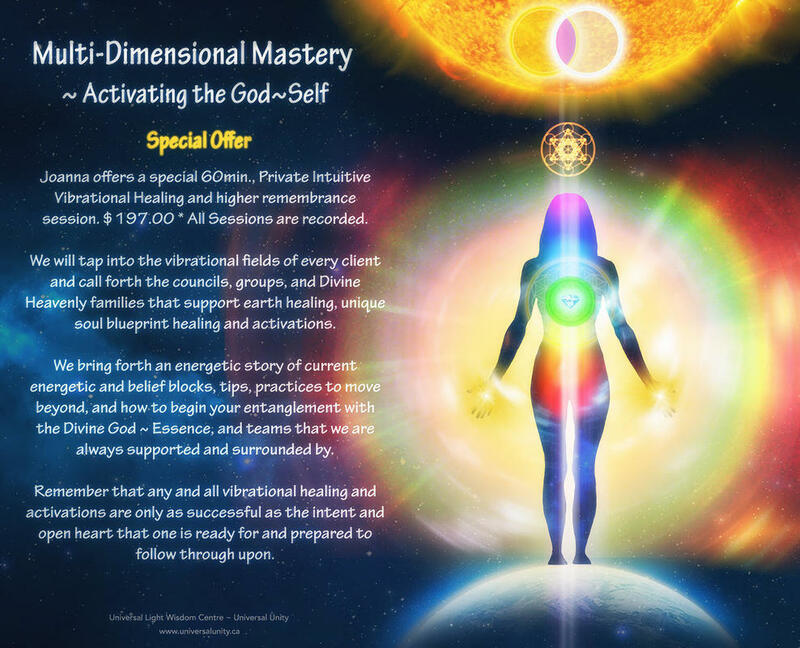 Affirmations, invocations, initiations with your celestial teams, the Arch Angels, Heavenly Councils, and Mother Father God, are just some of the ways in which you can begin to experience mastery from within come forth to play in heightened illuminated ways. Shine your light forth dear golden ones. Shine and enjoy this incredible earthly human experience in which you are truly the way showers of a Divine new beginning for all of humanity and the cosmic families ushering us into our Universal belonging. We will tap into the vibrational fields of every client and call forth the councils, groups and Divine Heavenly families that support earth healing, unique soul blueprint healing and activations. and teams that we are always supported and surrounded by. that one is ready for and prepared to follow through upon. Joanna L. Ross was born and raised in Victoria, B.C. Canada. At a very early age, she was innately inspired by not only the minute subtleties of all aspects of life around her, but was also aware of life moving within the ‘unseen.’ Joanna’s remembrance of her first higher dimensional visitation came after her awakening, and was only one of an infinite number of synchronicities that allowed her to initiate and enhance her understanding of the majestic and diverse multi-verse that we exist within. 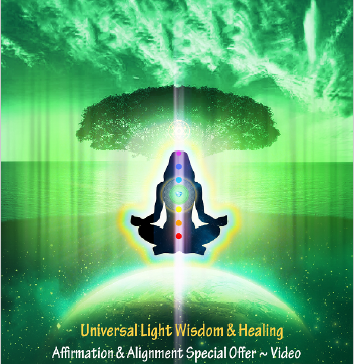 through profound visitations, healings, and lightship engagement throughout her enlightenment and ascension path, and is a great excitement that she inspires, educates, and empowers others to expand within their own expanding reality potential’s. Joanna is a high vibrational teacher of the profundity of our multi-dimensional human experience and through this Christed vibrational teaching and healing offering, many are moved and shifted in a myriad of ways, and is paramount in truly understanding our role in the human collective re- birthing into higher paradigms of reality experience. All unfolding’s are governed within the Divine orchestration within the All, and how may you manifest, create, and ignite the God-self within to experience the Heaven upon earth that we have destined ourselves to be a part of. Ignite your unique Divine gifts, Divine offerings, and the innate blessings within as we unveil the remembrance of our most profound earthly lifetime to date. Join us in this grand and Divine dance of Heavenly orchestration of humanity’s new dance of our Universal celebration and homecoming. Know the brilliance and the genius that resides within and how to unveil your unique creative excitements for greater aliveness, unity, harmony, abundance, and gratitude for Divine human story.